Long before Europeans discovered the secret of making true porcelain, they began producing wares that emulated the exquisite blue and white products imported from Japan. Majolica, delft, and faience are really names for similar ceramic products. An earthenware body is covered with an opaque in enameled glaze, usually colorfully decorated. In France, three types of production have been used. The grand feu technique fired the clay once, then dipped it in the liquid glaze; the artist painted the design on the dried glaze, then the piece was fired. 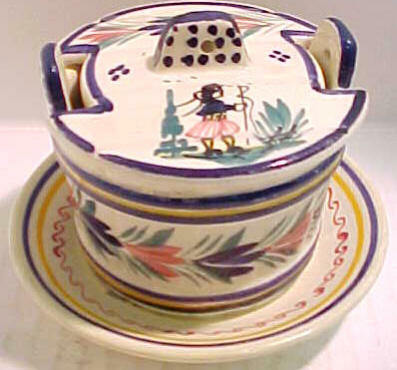 A later method was the petite feu where the piece was glazed and fired before the design was applied, then fired again. Faience fine, a later import from England, utilized a fine white clay covered with translucent glaze. The decoration was painted or transferred on the glaze and fired. 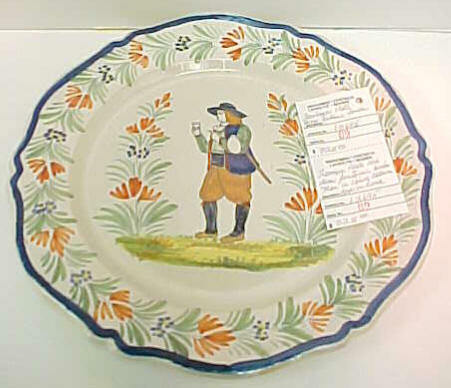 French faienceries (as their potteries were called) produced luxury goods; elegant tea sets, tiles, plates, and tureens for the noble and the fashionable in the 17th and 18th centuries. Louis XIV, the "Sun King", even built a tile covered building near Versailles for his favorite, Mme. De Montespan, with tin-glazed tiles from Holland and from Nevers and Rouen in France. With the introduction of Wedgwood's English Queen's Ware in the 1780's, faience fell out of fashion. The French Revolution, Napoleon's wars, and the general state of the economy completed the cycle, and many factories closed their doors. Those that remained turned to producing utilitarian items rather than luxury goods. 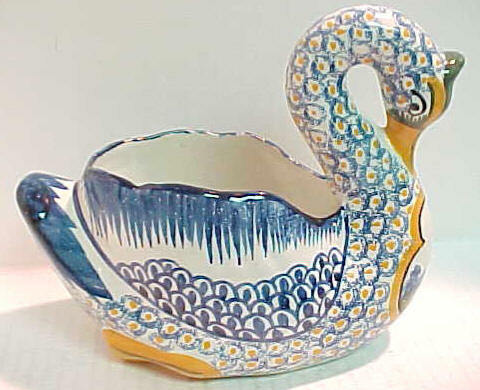 Only toward the middle of the 19th century did faience begin a resurgence in popularity. Today little of the early French faience is seen outside of museums. Fortunately for us, fashions change, and from the 19th century to today the colorful wares of Sarraguemines, Devres, Luneville and others, attract collectors worldwide. Perhaps the most universally known faiencerie is Quimper (pronounced kam-pair), whose depictions of Breton figures on their wares have remained popular. It was founded in 1695 by Jean Baptiste Bousquet in the town of Quimper, where wood for firing and good clay were abundant. Over its life the Quimper faiencerie has had many owners, and one of the most significant changes occurred in 1882 when the factory was sold. Up to that time most of the designs had emulated Rouen patterns; now they began to enlarge on Breton themes. Quimper remains the most recognized of all faience, and a number of books are available that provide a more detailed description. Sarraguemines near the German border, produces popular faience with a slightly German flavor. Their clay is finer than other areas, and the colors frequently more delicate. Founded in the late 1700's, the factory produced both hand decorated and printed wares (often black print with French mottoes). Strasbourg, on the German border, came to prominence because of its technical expertise. It was first to develop the petit feu method, which allows for the use of crimson, gold, and pink decoration of faience. The Hannong family died out at the end of the 18th century, and the factory closed, so interest shifted to faienceries in Loraine. Luneville is a name one still finds on many pieces of faience; they specialized in pottery decorated with flowers and coqs (roosters). 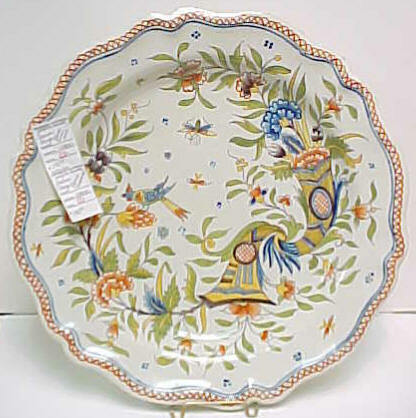 The Creil factory produced faience fine, a British import very similar to Wedgwood's Queen's Ware. 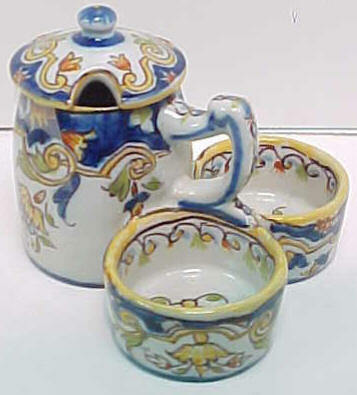 Where traditional faience entailed hand decoration, this new product lent itself well to printed reproductions. Later merging with the Montereau factory, the name Creil-Montereau appeared on products until 1955. Collectors today may encounter items resembling early Quimper products marked with an FF, which stands for Fourmaintraux Freres. The Formaintraux family had one of the potteries at Devres, and area near Boulogne long known for its excellent potters. The patriarch opened his establishment in 184 but the marks most often seen are from products produced by descendants in the later 19th century. Platters, candlesticks, plates, and jardinieres were produced and decorated with designs reminiscent of Rouen, Delft, and Moustiers.